The Dynamics 365 Operations ERP software has evolved to become an ERP leader in the mid-market and a strong contender in the enterprise market. The newest Microsoft release delivers ERP in the cloud and steps up the user experience. This independent Microsoft 365 ERP review examines the most strategic advantages and disadvantages of Microsoft's top ERP software. Microsoft NAV is a broad ERP suite that combines financial, distribution and light manufacturing software, along with unique capabilities for Service Management, integration to Dynamics CRM and a rich third party eco-system of add-on solutions. 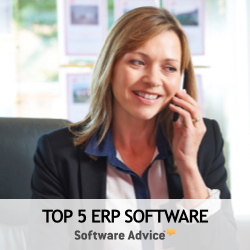 The ERP software product is targeted at the Small and Midsize Business market and has particular geo strength in Europe. Despite early stumbles and being a latecomer to the SaaS industry, the SAP brand carries considerable weight and Business ByDesign should be included in most SaaS ERP software evaluations. ByDesign has become the SAP cloud framework—so in this ERP review we examine the product capabilities along with a deep technology evaluation. Business One OnDemand is an ERP suite — with Finance & Accounting, Distribution & Inventory management, and Sales & Procurement — targeted to businesses at the smaller end of the SMB range (generally less than 50 users) and available as a SaaS ERP solution. Here's a quick ERP review of SAPs newest SaaS ERP software solution. Intacct is a best of breed SaaS accounting software system—and a recognized life-after-Quickbooks solution. The cloud accounting software feature sets are deep and mature, the system is logically organized around efficient back office business processes and the software supports compliance and governance policies. Now we advance beyond the highlights to drill down and examine this solution.